Audiomachy‘s Holofracture is a math metal album from the Australian duo. A rare sight in the genre, nowadays, is to have compositions based on genuine mathematical concepts, a few examples of which are listed in the album’s description on bandcamp. This makes not only for an alien sounding album, but also for an active and intellectually interesting listening experience. This album was released in 2014, but it’s very much up to date with the current math scene. The band is said to be working on a new album for 2017! 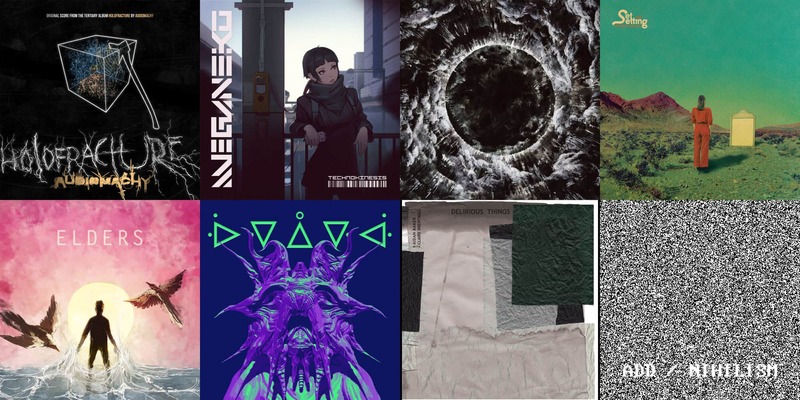 Meganeko is an awesome project from Sweden that creates chiptune-inspired electronic music including breakcore and dubstep. Technokinesis was released in August of last year, but has just now reached my attention, and I really like it. Definitely recommended if you like chiptune music, or any genre mentioned above. Only slightly less corrosive than Portal, The Ominous Circle brings out a heavy, abrasive, and obscure death metal recipe from Portugal to please our ears. Appalling Ascension came out this Friday, and features more than fifty minutes of clean-produced, dissonant, atmospheric death metal. That is a welcomed new discovery of unforgiving riffs. Set and Setting is an instrumental band from Florida, at the junction of atmospheric black metal and post metal. Reflectionless is their third album, and came out just yesterday. The collection of songs on this record is upsettingly good and well paced. From the black metal ‘Saudade’ to the post rock ‘Axiom Dream Within…’ to the very post metal ‘… The Mirrored Self’, Reflectionless inspires and pulls us into its world. It’s a stunningly well crafted album that deserves your attention. Elders, from the band of the same name, is a cheery, almost innocent math rock EP from the Floridan quartet. Just listen to ‘Keyser Soze’, and you’ll instantly fall in love with the funky, merry guitar theme and overall energetic and groovy music, but that’s just the beginning. All the songs on Elders compete for the most likeable without throwing away their mathiness. Qebrµs is unarguably a strange entity. It’s a one-person project, of unknown origin, creating experimental electronic music relying a lot on glitch, and writing in obscure unicode characters, often simply because of how the string looks rather of what it means. Their latest work, ᐔ ᐌ ᐂ ᐍ ᐚ (pronounce Woo we aai we waa), came out on British Love Love Records, and features six new songs, totalling just over thirty minutes of material. These tracks are rather hostile to the uninitiated, but nonetheless thoroughly enjoyable to anyone with a bit of patience or open-mindedness. Oh, and the digipak on which the album is sold looks sick! I wrote about Aidan Baker, not so long ago, for his involvement on one of the best ambient rock pieces in recent history – Werl -, but now he’s back, with Claire Brentnall, for a completely different endeavour. Delirious Things is an atmospheric and dark synthwave album that is hypnotic and shoegazy. My favourite track might be ‘Dead Languages’, just for its stellar vocal work and feelings of unresolvedness. Overall, it’s a cold album that will make you feel lonely, but it’s so good. Retail Monkey is an experimental mathgrind trio from Washington, all recorded and produced by one person. ADD/Nihilism is a bunch of ten-year-old compositions only now recorded and published. That couldn’t be better, though, because the twenty tracks on this thirty-odd-minute album are angry, dissonant, chaotic, and so, so rewarding. Definitely a must if you need ultra mathcore. On	January 28 2017, this entry was posted.